The Portland Timbers are already taking shape before their first MLS season next year. Today they announced the signing of four players to their MLS roster including three players from their 2010 D-2 roster. All three Portland players were former MLS players and are now returning to the league as well. The signings included forward Ryan Pore, midfielder Bright Dike, goalkeeper Steve Cronin and striker Eddie Johnson. The only non-Portland player to sign was Johnson who is coming up from the Austin Aztex. During the announcement Technical Director Gavin Wilkinson stated the club would likely sign at least two more players from their D-2 roster before the expansion draft next month. Most believe those two will either be Ian Joy, Khalif Alhassan or Mamadou “Futty” Danso. Portland went very attacking minded in their first round of signings which kind of leads me to believe they’ll go defensive in the expansion draft. If their other two signings are from their club I think they’ll be defensive as well but if they go outside of their club again like they did with Johnson I’d imagine they’ll be filling out their midfield some. Three of the four signings today are proven goal scorers in the D-2 level but two of those three (Pore and Dike) weren’t able to see much on the MLS level before. Ryan Pore had plenty of time in MLS before with Kansas City but was probably never utilized well during the time of Curt Onalfo’s run managing the team. He’s been very good with Portland these last two seasons which leads me to think he’s found a system that works for him. 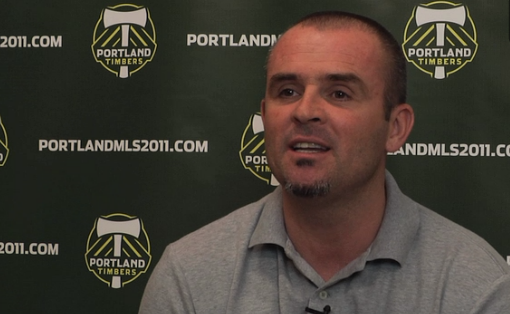 New Portland coach John Spencer will likely know how to use Pore too next year. Bright Dike was drafted by Columbus in the first round this past year but never made an appearance in a MLS game with the Crew as they released him before the start of the season. I have a feeling Dike will enjoy playing against the Crew next year. Eddie Johnson was a surprise pick in some ways as most expected Portland to sign only guys from their roster but they pulled a Seattle and went outside of the box in this signing. Honestly I love it as Johnson is a guy that knows his way around goal and could turn out to be another Sebastien Le Toux type of player. Steve Cronin was the only non-attacking player signed today by the Timbers. He’s been very good with the Timbers the last couple of seasons after spending time in LA. No doubt he’s got MLS quality but it will be interesting to see how he holds up against better attacking teams like RSL and LA this time around in MLS. What did you all make of the signings today by the Timbers?